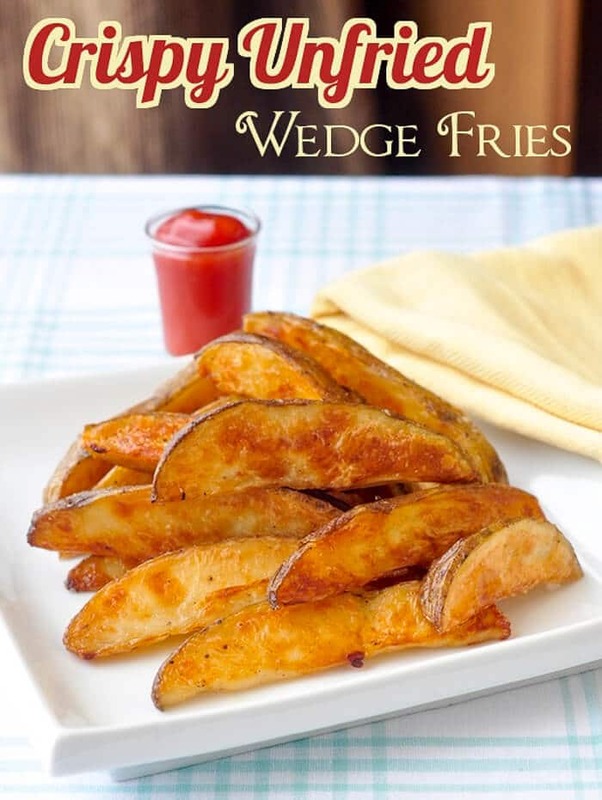 Crispy Baked Wedge Fries - Learn the secret to perfect crispy oven fries! Crispy Baked Wedge Fries. Learn the secret to getting all the flavour and crispiness of fried potatoes wedges from the oven using this simple straight forward method. Think great crispy baked wedge fries have to be deep fried? Not on your life; at our house we never do. Instead, we use the simple method we also use for making outstanding English Style Roast Potatoes. We par-boil the potato wedges for only three minutes to break up the starches on the surface, which greatly aids in getting them fantastically crispy without a lot of oil. We usually allow only one tablespoon of oil per person but I’m pretty sure that you could even cut that back a bit; as long as the wedges are all thinly coated with oil, they will be fine. You can peel the potatoes if you prefer, but we like to keep them on for extra flavour and nutrition. These are the perfect accompaniment to our juicy, tender, crunchy, Best Oven Fried Chicken recipe. As the recipe notes, you can add herbs or chili flakes to the potatoes before baking but you can also add flavour when they come out of the oven. Toss them in Cajun spice mix for a wonderful spicy version. As with roasting potatoes we often break up a head of garlic and simply throw the unpeeled cloves randomly among the wedges to infuse garlic flavour into the oil and potatoes. 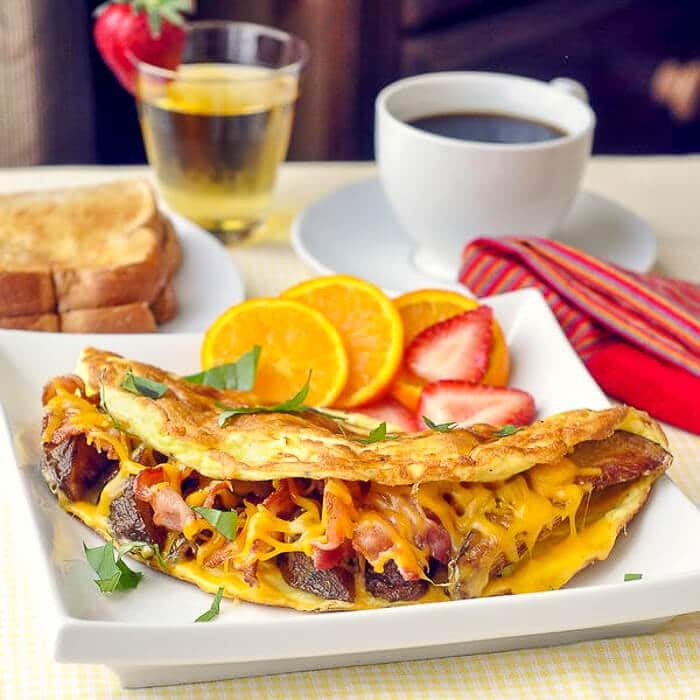 Potato Bacon and Cheddar Omelet – leftover wedge fries can become part of a hearty breakfast. Oh and one last thing, any leftover wedges can be quickly heated and re-crisped in a hot oven and even re-purposed for brunch like in this photo of the reheated wedges in a potato bacon and cheddar omelet. 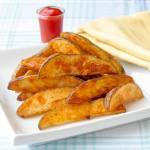 Like this Crispy Baked Wedge Fries recipe? You’ll find lots of other great ideas in our Side Dishes Category. For many other delicious morning meal ideas, check out our Breakfast & Brunch Category. Crispy Baked Wedge Fries - learn the secret to getting all the flavour and crispiness of fried potatoes wedges from the oven using this simple straight forward method. Preheat the oven to 425 degrees F. Preheat the cookie sheet in the oven as well. It is important that the fries hit a hot pan because this will help ensure that they do not stick to the pan. If the potato wedges sizzle when they hit the hot pan, that’s perfect. You’ll want to get the pan back into the oven as quickly as possible too. Bring 2-3 liters of salted water to a boil. Begin by washing the potatoes and cutting them in thick wedges. Drop the potato wedges in the boiling water and cook for 3 minutes exactly. Immediately drain the water off the potatoes and toss in the olive oil, salt and pepper. You can add additional seasoning at this point like herbs or chili flakes but they are great simply seasoned with salt and pepper. Spread the potato wedges in a single layer on a large preheated cookie sheet. Bake at 425 degrees F for about 30 minutes. Turn the wedges over once, half way through the baking time. Remove from oven, sprinkle with kosher salt and serve. 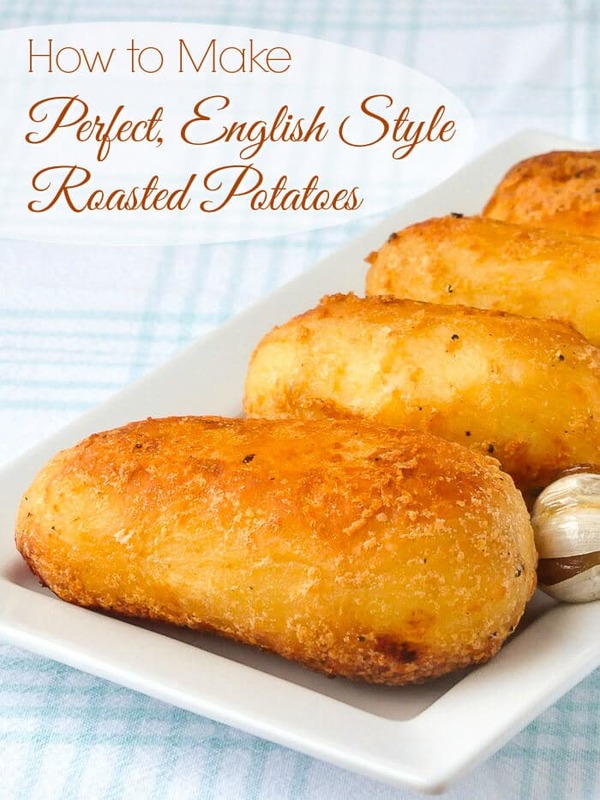 Hi there…these look amazing, and a bonus for no frying! I see you drain them, and I see you toss with oil, but do you pat them dry first? If not, does the oil adhere to the wet potato ok? No need to pat them dry, Marysue. Just let them steam off for a minute or two before adding the oil. They will be fine. B.
I like to use parchment paper on my baking sheets so the food doesn’t stick to the pan. Is that unnecessary for these? I love my parchment paper too but if you preheat the pan as instructed, it should not be necessary. Same here. I can’t remember the last tie I deep fried french fries. I never leave comments but I just wanted to let you know that I just finished eating these and they were amazing. Mu husband said that they were the best fries I’ve ever made so thank you! That’s Terrific Nadia. So glad you both enjoyed them. I’m having them with burgers myself this weekend when we have people over. Everyone seems to love them. I was just wondering if the cooking temperature was for a convection oven or do we have to drop the temperature by 25 degrees. I usually use regular bake for these fries. Quick question. Which hot pan is being referred to in the recipe, the preheated cookie sheet? Do you have to pre boil for 3 min for the oven baked potato recipe to work out? Has anyone tried it with no pre boil? The pre oiling is essential to getting a great crispy outside. Just a quick question- where does the garlic come in? Recipe looks great, going to try it very soon! You can add garlic cloves to the pan which flavour the oil as they bake.